They’ve been over-contemplated, criticized, applauded and looked up to. They can make or break the movie they’re in. And most importantly, they give us a peek into a world that’s a dazzling distraction from real life. We’re talking about our gorgeous item number actresses, of course. Dressed to the nines, their clothing and physiques are widely discussed. One thing that often gets overlooked, however, is their hairstyles. Which is a downright shame if you ask us because we’ve seen some of the best hairstyles in item numbers. 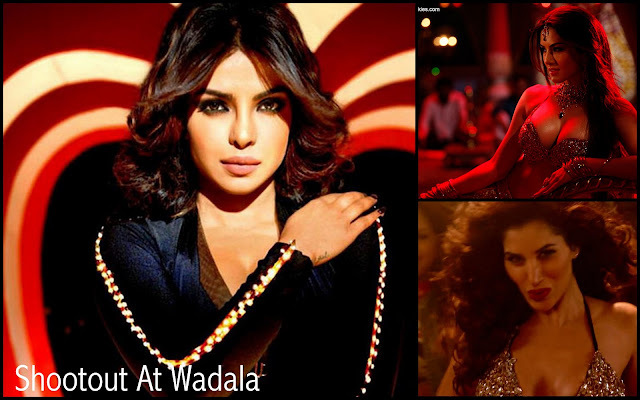 For example, Priyanka Chopra’s curled bob in Babli Badmaash Hai from the movie Shootout at Wadala. Quite an adventurous look for an item number, considering these songs usually feature women in traditional clothing with conventionally long hair. This song, however, features Priyanka in an edgy jumpsuit with her hair stylishly curled into a slightly long bob. We love her new hairstyle, what do you think? Also seen in the same movie are Sunny Leone and Sohpie Choudry. All three actresses sport entirely different hairstyles, much to our relief. Sunny Leone is seen with carefully styled hair cut into layers and straightened with outward flicks. The maang tikka captures the traditional statement her bra-choli fails to make, however, and we think it’s a nice accessory that sets off the layers around her face. The third actress to do an item number in Shootout at Wadala, Sophie Choudry makes her appearance in wildly curled hair. By wild we mean they’re a far cry from Priyanka Chopra’s structured curls. Sophie’s hairstyle has it’s own charm and character that we think comes across very well. Mugdha Ghodse also does an item number this year for the movie Saheb, Biwi Aur Gangster Returns, though her appearance is decidedly tame compared to those in Shootout At Wadala. Her long hair curled carefully below her chin, the front part of her hairstyle features a very slight bouffant parted down the middle. Also making a slightly tame appearance is Sonakshi Sinha in an item number for the movie Himmatwala. Her long hair impeccably straightened – really, you’ll notice every strand falls perfectly in place – she wears a sparkly head band around her forehead in keeping with the 80s theme. So now you know what the theme to your next party is going to be ladies! Just pile on the shine and add a glittery headband to top it all off. The entire look is super glamorous. Surpassing all these hairstyles with a small town charm is Jacqueline Fernandes in the film titled ‘Ramaiya Vastavaiya’. Her hair is tied back with a number of braids pulling away from her face, with a slightly rumpled texture to it. Adding to the entire look is her matha patti, which accentuates the rustic ensemble. Now you can’t wait to see the rest of the item numbers this year has to offer, can you? Us neither.